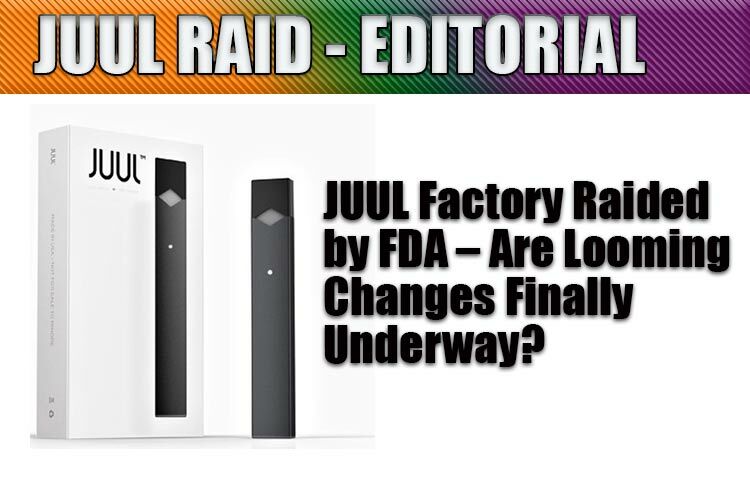 Home > Columns > John Manzione > JUUL Factory Raided by FDA – Why Now? Are Looming Changes Finally Underway? Sometimes, it DOESN’T pay to be number one. At least that’s what the executives at JUUL Labs are probably thinking right now. Because the company behind the most commonly recognized vape device around just got raided by the U.S. Food & Drug Administration (FDA). And this wasn’t a friendly visit. Though the raid occurred on Friday, September 28, JUUL Labs only disclosed the unannounced event yesterday, likely to gather its statements before letting the public know what transpired. But now that it’s out, the message is clear – the FDA isn’t planning on letting the youth smoking and vaping “epidemic” happen without a fight, and vape companies had better be ready to comply. 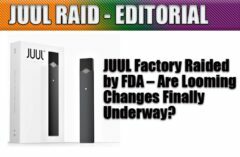 According to the FDA itself, the JUUL Labs raid was an unannounced, on-site inspection that resulted in more than 1,000 pages of sales and marketing documents being confiscated for further research. And apparently, this wasn’t the first time the FDA stopped by JUUL’s headquarters, with several visits already completed. Naturally, the core reasoning for the inspection was to confirm JUUL was being compliant with the laws and regulations currently in place to prevent underage use of nicotine products. This, we understand. But, after several prior visits, we need to wonder what information the FDA suspected was there, but not being offered up voluntarily. But if things were that agreeable, and the term “raid” was overblown, why the unannounced visit from the FDA? JUUL Labs has been very forthcoming since the FDA began increasing pressure on vape companies this month, reaffirming its dedication to preventing underage use of its products, or any vaping devices for that matter. And the company has complied with recent pressures from FDA Commissioner Scott Gottlieb, who once held a board member role with an e-cig retailer – one curiously named “Kure” we might add. While his acknowledgement of vaping as a transitional means for smokers is well-documented, his use of terms like “epidemic” when describing youth vaping is a little more alarmist than we’re comfortable with. It wouldn’t be a Spinfuel piece if our own opinions didn’t make an appearance, and this time, it might be more controversial than usual. But in our eyes and hearts, we feel that teenagers across the world will always find a way to rebel against authority. In short, if they want to smoke, they’ll find a way to smoke. If they want to vape, they’ll find a way to vape. And if we tell them “don’t do this” then they’re likely more inclined to do just that. It’s what’s happened since the beginning of time, and not something that’s likely to change because of FDA crackdowns. That’s not us being flippant and ignorant, it’s us accepting the reality that youth will always find a way to rebel against what authority tells it to do. Whether that comes in the form of alcohol, drugs, rock music or miniskirts is irrelevant – the point is that rather than fighting the behavior, we should be looking to nip it at the point of sale, both in stores and online. 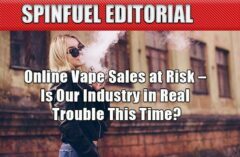 How is outright banishment of flavored vape products going to make a difference? Remember, kids were smoking cigarettes long before mango-flavored JUUL pods hit the streets. Was anyone discussing “youthful tobacco flavors” then? Doubtful. The government tried banishment once with alcoholic beverages… right around 100 years ago. Remind me of how well that worked out. And then ask me how often we hear about banning beer (or even beer ads) every time there’s a FAR-too-common underage drinking tragedy. We don’t. Because the government stands to lose too much money if alcohol becomes illegal. I’m no conspiracy theorist, but something tells me if the government starts making more money from vape companies, these extreme measures will lighten up considerably. Like it or not, underage drinking is a much bigger epidemic than vaping ever will be. Even if Gottlieb keeps expressing concern about teenagers vaping for the JUUL’s high-nicotine “headrush.” This is a generation of kids who voluntarily ate detergent pods, after all. Perhaps their words should be taken with a little extra salt. Now, don’t get us wrong. We’re not conceding the fight against underage vaping. And we’re not saying we won’t support future prevention measures. By all means, there needs to be less access to these products by underage customers. They’re designed for adult use, and only adult use. Likewise, we’ll always support the need for less-youthful packaging, presentation and marketing, because that should never be a target market. But responsible adults – especially those who have successfully quit tobacco through vaping – shouldn’t be punished for making a decision about their own habits and practices. We are just one site of many that supports the rights of adults to make better choices for their own health, and the health of those around them. FDA distrust and rash action will only truly hurt the legal, consenting adults who benefit most from vaping.